Middle East TETRA communications terminal market displayed a sharp growth in the period 2014-16. Increasing Oil & Gas exploration activities to increase the reserve capacity, growing manufacturing and commercial construction projects as well as inclination of the countries to provide modern public transportation facilities such as, Metro Rails, Trams, and others have led to the growth of TETRA terminals in Middle East region. Adoption of TETRA technology by the law enforcement and emergency services in prominent nations due to growing pressure to provide public safety in the wake of major upcoming global events facilitated the growth of this market. According to 6Wresearch, Middle East TETRA Communications terminal market size is projected to grow at a CAGR of over 7.7% during 2017-23. 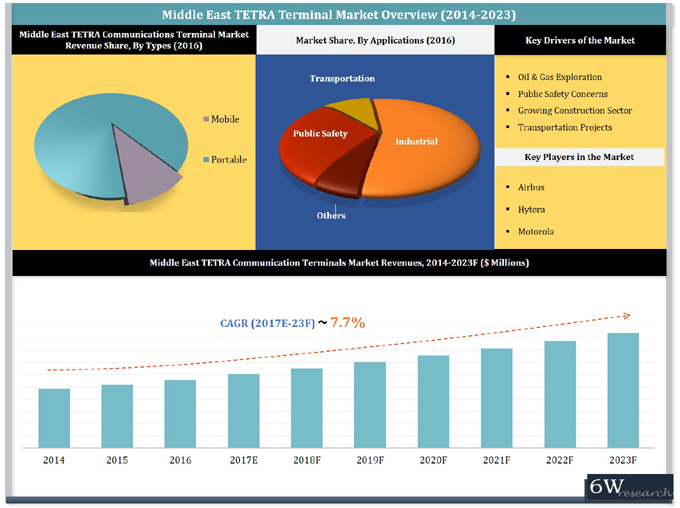 Portable TETRA terminals segment accounted for the largest share in the overall Middle East TETRA Communications terminal market share, owing to their increasing usage in industrial and public safety applications. Growing security and safety concerns pertaining to civic unrest in countries like Turkey as well as rising terrorist threats led the law enforcement forces to enhance their capabilities to avert and combat crisis situations. Industrial, transportation, and public safety are the major applications of TETRA terminals market in Middle East region. Industrial application of TETRA terminals is expected to grow sharply in the forecast period due to their major use in Oil & Gas fields, manufacturing plants, and energy projects by the construction crew as well as operation teams. Middle East TETRA communications terminal market report thoroughly covers Middle East TETRA communications terminal market by types, technology, applications, and countries. Middle East TETRA communications terminal market outlook report provides an unbiased and detailed analysis of the on-going Middle East TETRA communications terminal market trends, opportunities/ high growth areas, market drivers which would help the stakeholders to decide and align their market strategies according to the current and future market dynamics.